This year marks the 50th Anniversary of the Wilderness Act. In our local area the first designated wilderness was the San Rafael Wilderness. Created in 1968, the San Rafael Wilderness encompasses close to 200,000 acres of protected land that includes portions of the San Rafael Mountains, Hurricane Deck, Manzana Creek and the Sisquoc River. Here, within these natural lands you will find pine-covered mountains, hidden waterfalls, quiet potreros, Chumash village sites, and old homesteads. 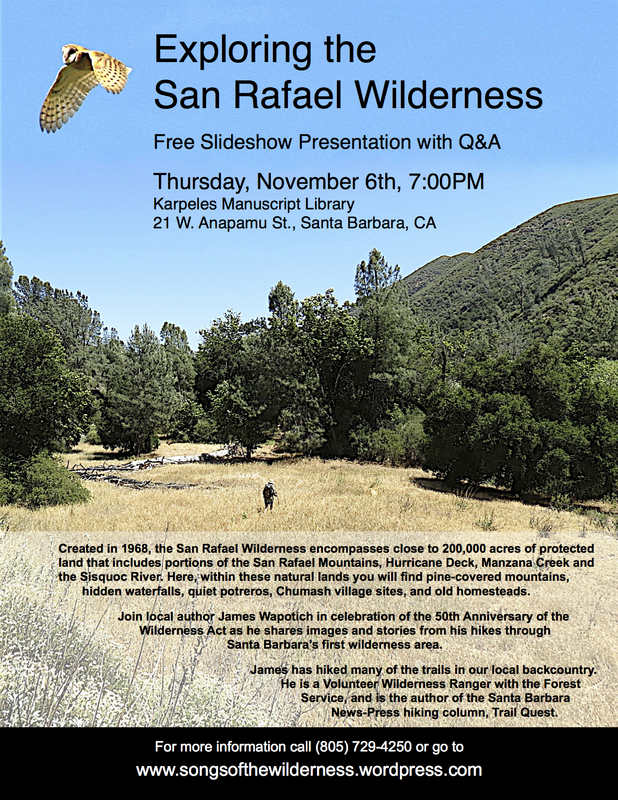 Join local author James Wapotich in celebration of the 50th Anniversary of the Wilderness Act as he shares images and stories from his hikes through the San Rafael Wilderness. The presentation will include destinations that can be reached as part of a day hike or overnight backpacking trip, as well as those best seen as part of a multi-day backpacking trip. James has hiked many of the trails in our local backcountry. He is a Volunteer Wilderness Ranger with the Forest Service, and is the author of the Santa Barbara News-Press hiking column, Trail Quest. For more information regarding the talk, email me at jwaptotich@yahoo.com.